Whatever you think can’t be done, somebody will come along and do it. But are they really worthy of the term? In last month’s Editor’s Corner I talked about the art of arranging, citing the genius of Brian Wilson as an example. It’s an appellation often given to the famed leader of the Beach Boys, and in his case I think it’s justified, but as I was writing the piece it got me thinking about what the word actually means. Steve Lacy’s notebook, with tips from Monk. The Oxford Dictionary tells us that it signifies “exceptional intellectual or creative power or other natural ability.” But I feel that a far better definition was provided by Thelonious Monk. The legendary jazz pianist was almost as well known for his dispensations of wisdom as he was for his distinctive composing and playing skills. 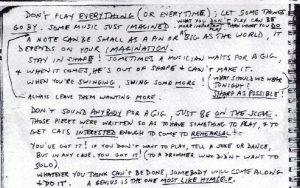 As scribbled down by one of his sidemen (soprano sax player Steve Lacy) in a spiral-bound notebook way back in 1960, Monk’s primer of do’s and don’ts have become a kind of bible for musicians everywhere. There have been many inspiring examples of people coming along and doing the “impossible” throughout history. 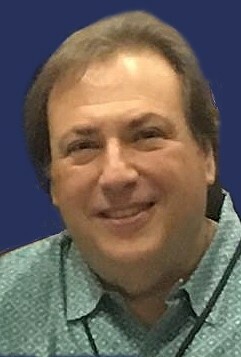 From the light bulb to recorded sound (incredibly, both inventions from the mind of one man — Thomas Edison), from the automobile to the airplane, from the telephone to the smartphone, from the computer to the internet, these are all parts of our everyday life that would have seemed unthinkable not all that long ago. But more importantly, I think, is the second part of Monk’s assertion. What he’s saying (much more poetically than I ever could) is that a genius has to be an individual and have the courage of their convictions … no matter what. “Be open to trying things, and you will find your sound. At the end of the day, it’s what you think sounds good and what feels good to you. It might be in line with other people who will want to work with you because they love the way you hear things. Or it might work against you because they don’t like what you do.” In other words, irregardless of opinion, you need to follow your own path. So be unafraid. Do the undoable. Be yourself. Have the courage of your convictions and the strength to stand by them even in the face of adversity. Achieve these goals and someday you just might find yourself on someone’s list of musical heroes (not just your mom’s! LOL) … and they might even think of you as a genius. 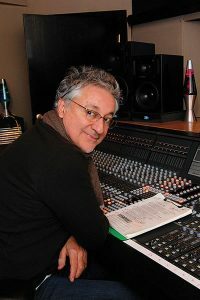 Photo of Humberto Gatica courtesy of Uno Productions.